Sharing your campaign pages or email campaign archive is a great way to promote your content, but there may be some information that should only be seen by your subscribers, or a specific subscriber segment. If you want to hide, limit, or customize your email campaign archive or content in a sent campaign, there are a few ways to do this. In this article, you'll learn how hide and manage your sent campaign content. Make sure you're familiar with campaign archives and how they work. The send date and subject line for campaigns displayed in your email campaign archive can't be edited. Most Mailchimp campaigns include a campaign link that allows subscribers to open the browser-based campaign page for your sent campaign, so they can still view the message if their email client has display problems. This also lets subscribers share your campaign with friends or on social media. Depending on the template you work with, your campaign link will display the following text in your campaign preheader, and sometimes in the footer. If you don't want subscribers to share your campaign, you can remove the campaign page link, but this may mean subscribers who have HTML display issues or image blocking in their inbox won't be able to see your message. To remove the campaign link, follow these steps. On the Design step, click the Text content block that contains the campaign link. In the editing pane, highlight the link, and use the delete button on your keyboard to remove it. If you don't see the link in the editing pane, check to see if the Text content block is formatted in columns. Click Column 2, then highlight and delete the link. When you design your campaign, you can use conditional merge tags to replace or remove specific content from the browser-based campaign page. For example, you might want to send an invitation to a private event, but hide ticketing information from the campaign page. Content that's hidden won't be visible to people who view your campaign but aren't subscribed to your emails, like social media followers or Forward to a Friend recipients. To use conditional merge tags to hide content from the campaign page, follow these steps. On the Design step, click the content block that contains the text you want to work with. Insert this merge tag before the text you want to hide. Insert this merge tag after the text content you want to hide. The content between the *|IFNOT:ARCHIVE_PAGE|* and *|END:IF|* merge tags will display for your subscriber, but will be hidden from the campaign page. Repeat these steps to hide any additional content from the campaign page. To preview how your campaign page will look, go to Preview Mode and click the View this email in your browser archive link. To hide certain content and show different text in its place on the campaign page for your sent campaign, follow these steps. Insert this merge tag before the text you want to show to subscribers only. Add this merge tag after the text you want to show subscribers. The text between the *|IF:ARCHIVE_PAGE|* and *|ELSE:|* merge tags will only display on the on the campaign page for your campaign. The text between the *|ELSE:|* and *|END:IF|* merge tags will only display in subscriber inboxes. To preview the campaign page for your draft campaign, go to Preview Mode and click the View this email in your browser archive link. The campaign page for a sent campaign includes an Archive Bar that helps people translate your email campaign, view recent email campaigns sent to the audience, and more. When the Archive Bar is on, these options appear at the top of campaign pages. This button links to the Mailchimp-hosted signup form for your audience. This button links to the email campaign archive for your audience. This menu allows subscribers to translate the campaign content into one of our available languages. This button links to an RSS feed for your campaign page. This button lets people who view your campaign page share it on social media, or copy the shortened URL for your campaign. This option isn't available for Regular campaigns. The Archive Bar is enabled by default, but you can disable it if you don't want people to access your recent campaigns. This will hide your campaigns from the general public, but won't delete any campaign data from your account. To disable the Archive Bar, follow these steps. Uncheck the Activate the "archive bar" for this list box. Now subscribers won't see the Archive Bar when they view your campaign pages. You can re-enable it at any time. 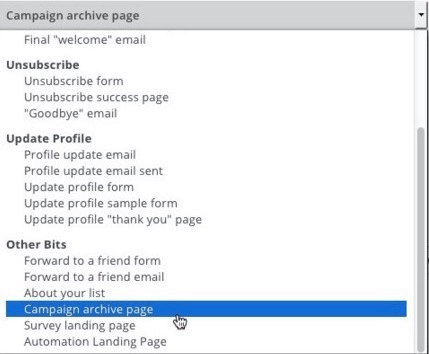 The email campaign archive displays 20 of your audience's most recent campaigns. To only show specific campaigns, designate a folder of campaigns to display on the archive. First, create a folder and add the campaigns you want displayed in the archive. Then, set your archive to display only that folder's campaigns. To edit the archive to show only the contents of your designated folder, follow these steps. Click the Forms and response emails drop-down menu, and choose Campaign archive page. Check the box next to Only show campaigns in a specific folder, and choose a folder from the drop-down menu. Now your email campaign archive will display the 20 most recent campaigns from the folder you chose. To remove campaigns from the email campaign archive, we recommend you filter your campaigns with a folder, so only the campaigns you choose display in the archive. Alternatively, you can use a custom archive on an external website, or delete the campaigns. If you need more control over your archive, use a custom archive hosted on your website instead of the Mailchimp campaign archive. To do this, you'll turn off Mailchimp's Archive Bar and embed a custom archive on your website. A custom email campaign archive allows you to choose which campaigns display, and set the number of campaigns that appear. We typically advise against deleting campaigns because this action also removes campaign reports from the Reports section of your account. However, we realize that some campaigns may need to be completely removed. When you delete a campaign from the Campaigns page in your account, it won't be removed from subscriber inboxes, but it will be removed from your email campaign archive and break any archive links to that campaign. Learn how to share prior email campaigns with new subscribers or people outside of your Mailchimp audience.